Please do let us know when you need an invitation or similar document from us, in order to complete your visa request. We're determined to help you cover at least some of the cost for accomodation / travel. Please reach out to the organisation in case you'd absolutely need help with this. Likewise, when you'd need childcare, let us know: floor@euruko.org A light lunch, drinks, and snacks (dietary restrictions are accounted for) for both conference days are included with the diversity ticket. 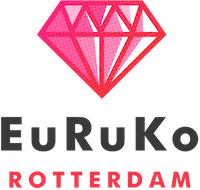 Sorry, applications for EuRuKo Rotterdam 2019 are closed.